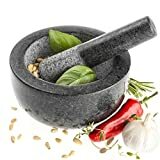 H&S stylish granite mortar and pestle with textured mortar interior and comfort shaped pestle is ideal for crushing a variety of herbs and spices to infuse flavour into food. The attractive bowl shape and granite finish looks beautiful in any kitchen and is then ready and easy to hand. 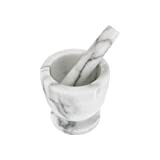 The Maison & White Granite Pestle and Mortar is the perfect addition to any home or professional kitchen. 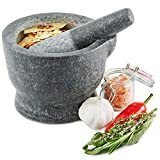 Use this premium pestle and mortar for crushing and grinding your chosen ingredients to makes pastes, dressings, pesto and seasonings with ease. The large 16cm diameter gives you plenty of surface area inside the bowl, and the shape makes it as ergonomic as possible for smashing, squashing and crushing. 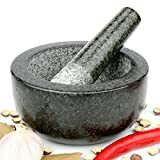 Made from 100% granite, the pestle & mortar will not absorb any liquid so any oils you extract stay in the bowl until you are ready to add them to your cooking. 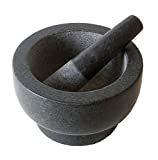 Hardwearing and highly durable, this pestle and mortar are made from 100% granite. 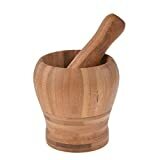 The traditional design of our pestle and mortar makes it an excellent tool for crushing and grinding. 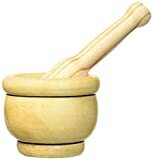 Please note - This Pestle & Mortar should be cleaned before use. 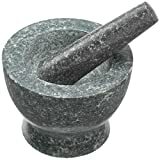 Grind, crush, pound spices and herbs with the Solid Granite Pestle and Mortar Set and is the ideal gift cefs and cooks. Due to the natural properties of the granite stone, the stone wont absorb any liquid allowing you to extract oils from herbs and spices with ease. The pestle mortar set is ideal for infusing ingredients such as sage, basil, tarragon, garlic, pepper for your own dressings, pestos and pastes. Made of premium quality granite stone , The pestle and mortar set will not look out of place in any kitchen. When it comes to taste, fresh ingredients are always better. 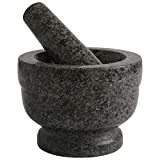 A granite pestle and mortar will let you grind just enough of your fresh herbs or spices for your recipe, and this can make quite a difference compared to using processed and dried versions. 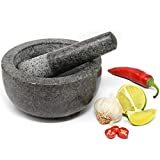 The large mortar and pestle set is made from solid granite, giving it a high quality look and feel. But don't be put of, you don't need to be a michelin star chef to take advantage of this handy piece of kitchen equipment. There are three techniques for using a stone pestle and mortar, each one gives different results so you'll need to match your technique to your recipe and desired outcome. The mortar & pestle is an ancient tool that's been around for millennia, with the earliest ones found dating back to 35,000 BC. Through the ages, this mechanism been used for hundreds of purposes from cooking to pharmacy & pharmacology to masonry, and is a utensil that no modern kitchen should be without. 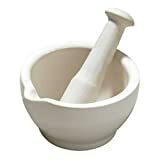 Handy and convenient to use, mortar & pestles also add a touch of stoic flair to any kitchen décor. Our Cooler Kitchen EZ-Grip Mortar & Pestle WILL NOT SLIP or slide all over your counter every time you try to use it to crush. You need something that stays firmly in place! Our Mortar has a silicone base, to keep it firmly still while you grind. Also for added convenience, our Pessle has a silicone EZ-GRIP Handle to make it easier to get the perfect grip to easily grind. No more struggling to find the right grip! Our product is better than an electric spice grinder. Crushing the fibers of herbs, as opposed to chopping through them (like with a spice grinder), releases the full range of essential oils, flavors and aromatics that they contain. Hand grinding is what gives chili and curry pastes that distinctive breadth and depth of flavor that you won't find if you're prepping ingredients with a food processor. 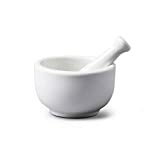 Our Mortar & Pestle is the best for: powdering herbs, grains, spices, coffee, nuts, roots, teas, bread, crackers, biscuits, fine powders, chemistry and laboratory use, or even for crushing medications for pets and humans alike. Also ideal for unlocking the hidden oils in your pantry of dry spices. The sky is the limit! This Morter & Pestle is absolutely dishwasher safe, but also easy to clean in your sink with some soap and water. The apothecary-grade porcelain material is strong and non-porous. More versatile than a Japanese suribachi, Mexican granite molcajete, or Turkish or Thai mortars. pulverizer, crusher or pessel and base of mortor is covered in food grade black silicone and can take a pounding without breaking. The new Savisto pestle and mortar is one of the most iconic pieces of kitchen equipment around. Designed to allow you to get the most out of your herbs and spices, it enables you to infuse your food with new and exciting flavours! 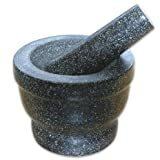 The pestle and mortar is made of premium quality solid granite. 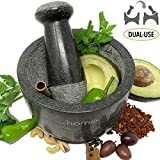 Used by professional chefs the world over, this pestle and mortar combo is ideal for grinding, crushing and pounding any spices and herbs for dressings, pastes, sauces, seasonings, herbal remedies and more! The interlocking, crystalline nature of the granite stone ensures that it is one of the hardest materials around - this sturdy structure means it's not only durable and long-lasting; it also does not absorb any liquid. This enables you to extract oils from herbs and spices with no loss of liquid! Not only is the pestle and mortar practical for every-day use, it is also à la mode, with a timeless style that's guaranteed to fit seamlessly onto any kitchen worktops, no matter how rustic or modern. Whether a budding gourmet or an accomplished chef, this efficient and workable tool is sure to add a certain je ne sais quoi to both your dishes and your home! Porcelain mortar and pestle set provides a simple way to crush and grind seeds, nuts and other substance that is softer than porcelain. 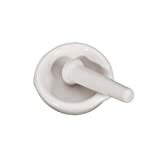 Glazed pestle handle allows easy grip with comfort, unglazed pestle tip gives a slightly rough finish for better grinding. The mortar comes with a flat and unglazed bottom for stability. FDA approved. Certified by FDA as fit and safe for processing food for human consumption. Excellent addition to your kitchen that gives peace of mind. 1. 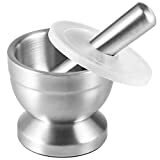 Both mortar and pestle are made of food grade 18/8 stainless steel. 2. Not only is it rustproof, it is also resistant to damage and corrosion by acidic food. 3. Solid stainless steel of the pestle feels substantial in your hand and is ready to crush anything asunder. 4. By its nature, stainless steel is a food-safe material that is both rustproof and resistant to corrosion by food acids. Simple cleaning and maintenance are all it takes to keep it safe and last a long time. 1. Cleaning is easy using mild detergent and rinsing under the tap. 2. And unlike ceramic or clay grinders, you do not have to worry about chipping it with heavy strikes. 3. Unlike its wooden counterparts, this mortar will not retain leftover odor and carry it over to other foods. 1. Translucent lid allows you to gauge your strikes while keeping flying debris from making a mess. 2. The mortar sits unmoving on your counter helped by its weight and anti-slip padding on the bottom. Update your kitchen counter with practical and effortless style when you introduce a Homiu granite pestle and mortar with base set.